The City of Columbia, Missouri published its greenhouse gas inventory in June, 2007. The report studies emissions in the years 2000 and 2005. 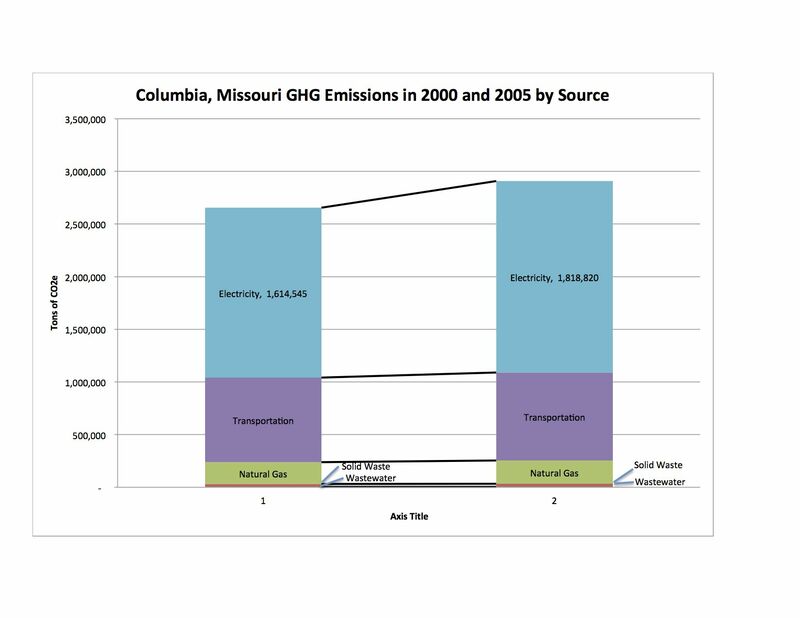 Columbia is home to the University of Missouri, which operates its own power plant (at the time of the inventory, one of the most GHG intensive in the state), and data from Mizzou was incorporated into Columbia’s inventory. In 2000, Columbia emitted 2,650,340 short tons of carbon dioxide equivalent (STCDE) of GHG. 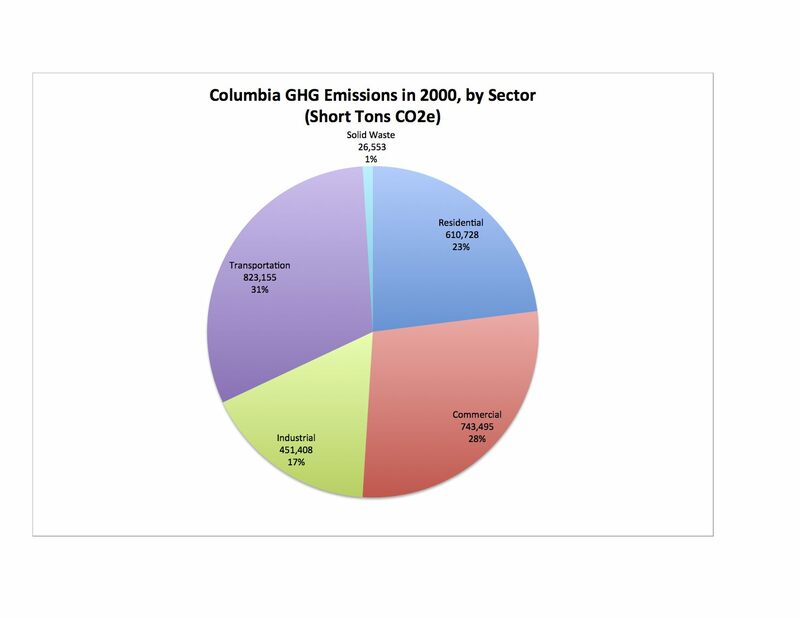 More recent GHG emission inventories report emissions in metric tons, so Columbia’s results would need to be adjusted in making any comparisons. The population in 2000 was 84,531, according to the U.S. Census. This calculates to per capita emissions of 31.35 tons CO2e per person. This compares to 28.9 tons per person statewide. Columbia is a job center, with significant commercial and industrial activity. Thus, it is not surprising that its per capita emissions were higher than the statewide average. By 2005, GHG emissions had grown by 5%, to 2,908,547 tons of CO2e. Emissions from electricity and from solid waste grew the most, each by 13%. The Census Bureau estimates that during those years population grew to 94,211, an increase of 11%. Thus, per capita emissions decreased slightly, to 30.9 tons of CO2e per person. I don’t have statewide statistics for 2005. Columbia did not report emission amounts by sector. For 2000, however, it did report total community emissions and the percentage represented by each sector, allowing the amounts to be calculated. The first graph at right shows the result. Columbia’s emissions were relatively balanced among the transportation, commercial, residential, and industrial sectors. Columbia studied its emissions by source (electricity, natural gas, transportation, wastewater treatment, and solid waste). The graph shows total GHG emissions and the amount from each source in 2000 and 2005. The bulk of Columbia’s emissions derived from the consumption of electricity and the consumption of fuel for transportation. University of Missouri Power accounted for 406,244 tons CO2E, or 15% of total emissions. Solid waste and wastewater accounted for a tiny fraction of total GHG emissions. In future posts we will see that this is a common finding. Columbia did not study emissions from government operations. These are a subset of total community emissions; most communities study them separately because local governments are in a position to directly control emissions from their own operations, but can only hope to influence overall community emissions. In addition, many local governments wish to take a leadership position on reducing GHG emissions, and view an inventory of them as an essential first step. City of Columbia Emissions Inventory, City of Columbia website, http://www.gocolumbiamo.com/Council/Minutes/documents/2007_jun18_precouncil_emissions.pdf. Table 4: Annual Estimates of the Population for Incorporated Places in Missouri, 4/1/2000 – 7/1/2009. U.S. Census Bureau, https://www.census.gov/popest/data/cities/totals/2009/SUB-EST2009-4.html. By mogreenstats in Climate Change on 2013/01/15 .